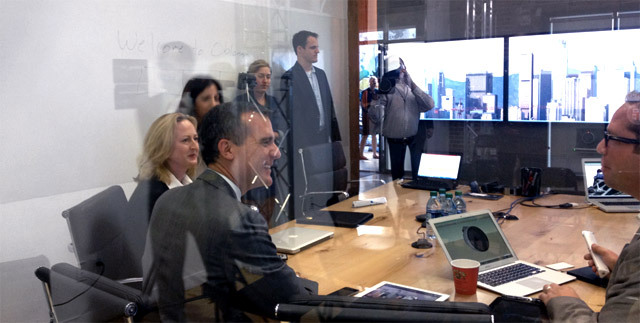 It’s Innovation Week in Los Angeles, and Mayor Eric Garcetti decided to arrive early to his own press conference at Oblong HQ to experience first-hand our Mezzanine conferencing and collaboration technologies for innovative workplaces. Journalists from ABC, NBC, CBS, Fox, KPCC, Los Angeles Daily News and the L.A. Times were on hand to hear the Mayor talk about the results of a new report from the LAEDC that indicate Los Angeles is home to more tech jobs than Santa Clara County (the heart of Silicon Valley), San Francisco, Boston or New York. It was the first time they’d run the numbers, but for some the numbers weren’t all that surprising. As Peter Marx tweeted in reference to the LA Daily News article, “We knew. Now we KNOW.” Conan Nolan, NBC4, has the story here. We’re proud to be among those making Los Angeles a world-class center of technology and innovation. Join us as we celebrate on Thursday.